Insys Therapeutics, the Arizona-based pharmaceutical company that recently became the biggest financial supporter of the campaign against marijuana legalization in that state, makes an oral spray that delivers the opioid painkiller fentanyl and plans to market another one that contains dronabinol, a synthetic version of THC. Insys says it gave $500,000 to the main group opposing Arizona’s legalization initiative because the measure “fails to protect the safety of Arizona’s citizens, and particularly its children.” But one needn’t be terribly cynical to surmise that Insys also worries about the impact that legalization might have on its bottom line, since marijuana could compete with its products. A new study suggests Insys has good reason to worry. In an articlepublished last week by the American Journal of Public Health, Columbia University epidemiologist June Kim and her colleagues report that fatally injured drivers are less likely to test positive for opioids in states that allow medical use of marijuana. That finding, together with the results of earlier studies, indicates that making marijuana legally available to patients saves lives by reducing their consumption of more dangerous medications. Kim et al. collected data from the Fatality Analysis Reporting System (FARS) for 1999 through 2013, focusing on 18 states that drug-tested at least 80% of drivers who died in crashes. They found that drivers between the ages of 21 and 40 were half as likely to test positive for opioids in states that had implemented medical marijuana laws (MMLs) as in states that had not. The fact that a driver tested positive for opioids does not necessarily mean the painkillers he took contributed to the crash, so it is not safe to draw any conclusions about medical marijuana’s impact on traffic safety from this study. But the FARS data are an indirect way of measuring the extent of opioid consumption in a given state. Kim et al. 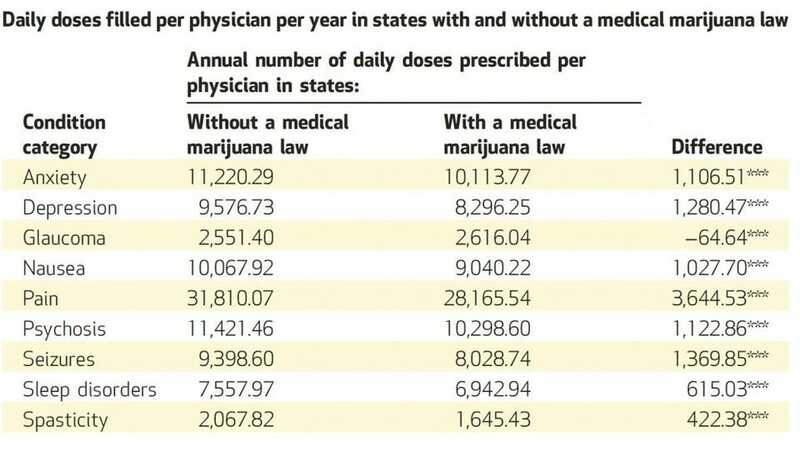 note that “severe or chronic pain is among the most common indications cited by medical marijuana patients.” It therefore makes sense that opioid use would decline (or rise less) in states that recognize cannabis as a medicine. Medicare prescription drug coverage is mainly available to people who are 65 or older, although people receiving federal disability payments also can qualify. Bradford and Bradford note that “previous studies have suggested that Medicare patients may make up a relatively small percentage of people who use medical marijuana and that only 13–27 percent of people who used medical marijuana were ages fifty and older.” But Kim et al.’s analysis of FARS data suggests a similar shift to cannabis from other medications is occurring among 21-to-40-year-olds, who account for the bulk of medical marijuana users. Other studies indicate that replacing prescription drugs with marijuana reduces opioid-related deaths. 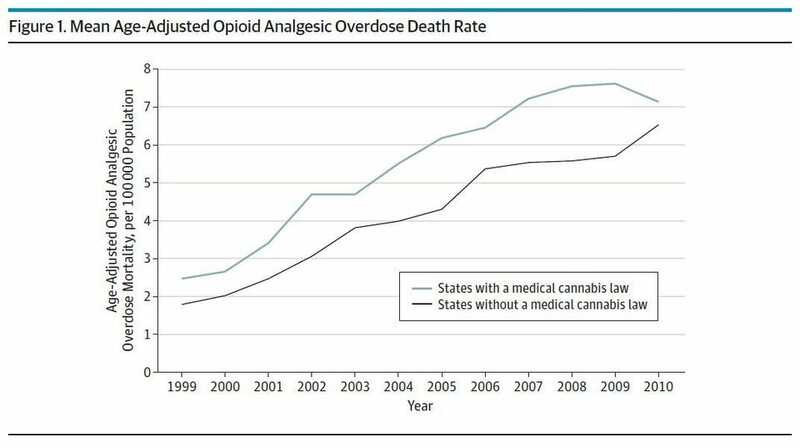 A 2014 study reported in JAMA Internal Medicine, based on death certificate data from 1999 through 2010, found that “states with medical cannabis laws had a 24.8% lower mean annual opioid overdose mortality rate…compared with states without medical cannabis laws.” Furthermore, internist Marcus Bachhuber and his co-authors reported, “such laws were associated with a lower rate of overdose mortality that generally strengthened over time,” which makes sense if more patients are switching to marijuana from opioids (or choosing marijuana rather than opioids) each year. A working paper published last year by the National Bureau of Economic Research confirmed that the legal availability of medical marijuana is associated with a relative decline in opioid-related deaths. RAND Corporation researcher David Powell and two colleagues extended Bachhuber et al.’s analysis by including three more years of data. They also looked at drug treatment admissions related to opioids and found that they became less common in states that implemented medical marijuana laws. Even while sounding the alarm about an “opioid epidemic” that included a record number of painkiller-related deaths in 2014, the federal government insists marijuana has “no currently accepted medical use.” Judging from these studies, its dogmatism may be deadly.